There are so many great posts about Barcelona out there, but most of them describe the same attractions over and over again. What if you have already seen the main sights and want to visit something new? 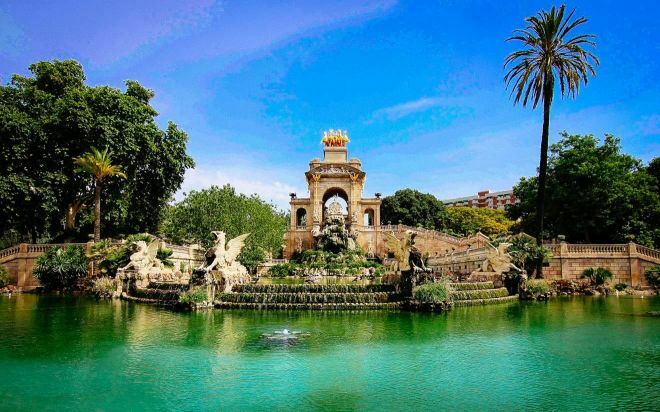 Or maybe you just want to escape the crowds and see some great lesser-known places in Barcelona? 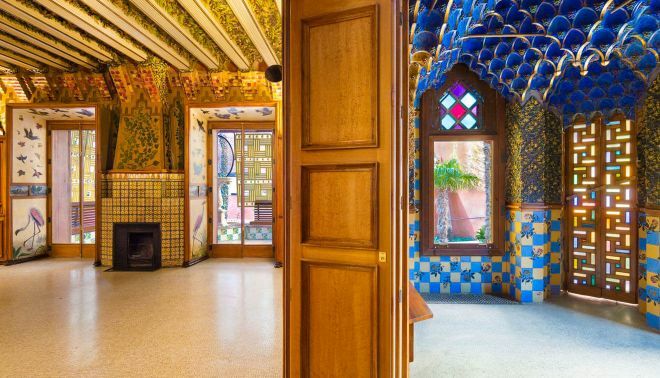 (By the way, if you want to avoid crazy lines on popular attractions such as Sagrada Familia and Casa Battlo, I have an article with some secret tricks just for you!). But let’s come back to some places in Barcelona that are off-the-beaten-path. Staying in the city for 2 months allowed me to discover some unique and spectacular places that most of the tourists do not know about. 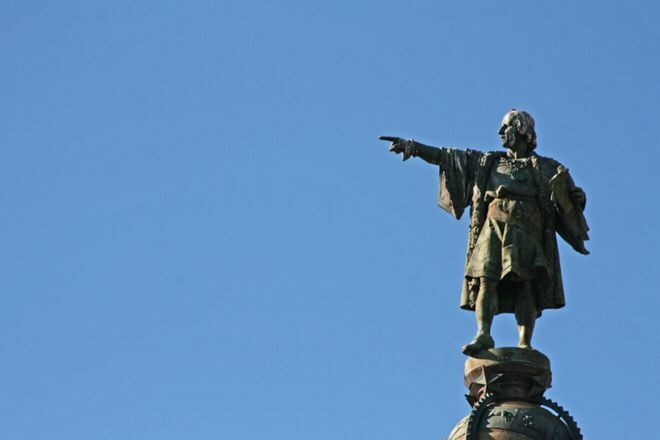 Located right in the city center in front of Barceloneta beach, the column of Columbus is something that you will probably see many times. But would you ever think there is an elevator inside the column that provides a wonderful view over the city? I had no idea about it until recently, when I was reading some information about it on the friendly Barcelona Tourism site. I think the main reason it is relatively unknown is because the entrance is quite hidden. There are stairs that lead you down to the base of the column, but it looks just like an information center. While you can certainly ask for information there, there is also a cash register, where you can buy your tickets and proceed to the elevator. The best part? It is cheap and almost no people are there! How to get there: Metro: L3, Drassanes stop. 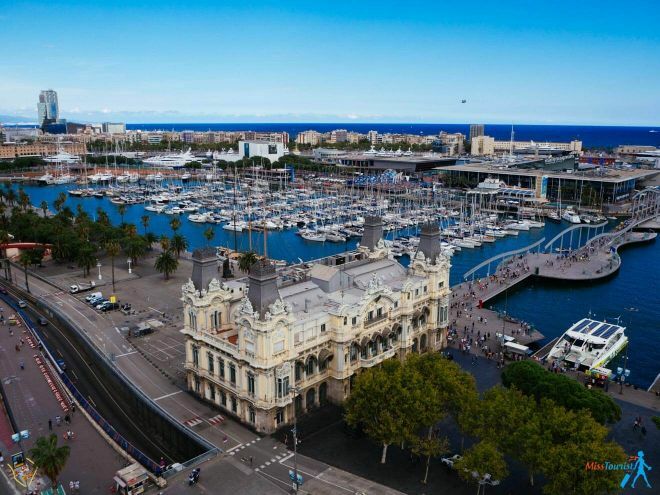 The Column is located at the end of La Rambla boulevard close to the sea. 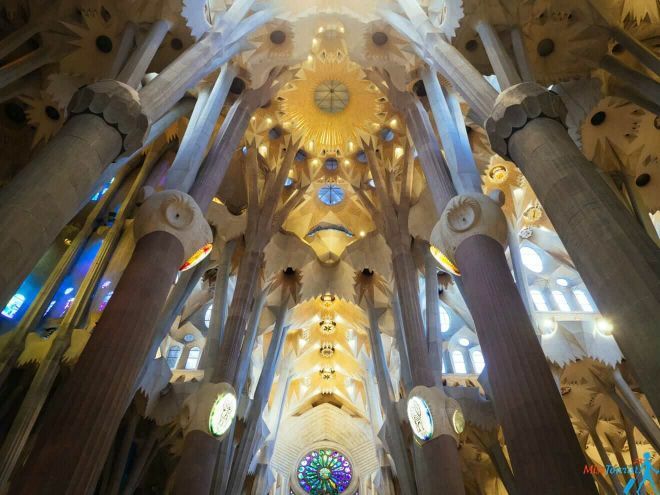 Are you a fan of Gaudi architecture, but you have already been to Casa Battlo and Sagrada Familia? Or maybe you don’t want to go there because it’s too crowded? I might have a great solution for you – pay a visit to a … hospital! Wait, why is she sending me to the hospital during my vacation? The reason I suggest visiting the hospital is that it is one of Europe’s foremost art-nouveau sites! Just look at its doms, facades, beautiful sculptures and stained-glass windows everywhere. Isn’t it a masterpiece? It reminds me of the hospital from Harry Potter where he was recuperating after his fights with Voldemort. 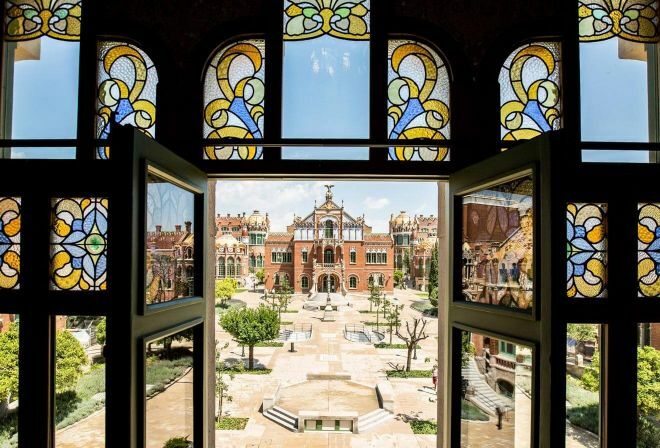 You can enter one of the pavilions and see its interior exactly as it was designed at the beginning of the 20th century, get down the tunnels and learn some well-known medical practices in Barcelona at that time. P.S. There are also some live music events organized in the summer, you can see the schedule here. Price: Self-guided visit is 14€, a guided visit is 19€ and visiting it from the outside is free. Updated price here. Update: I found tickets for 13 eur here! 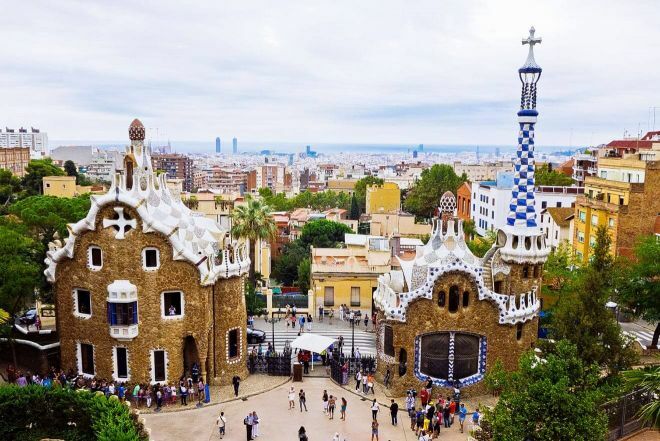 Also, you can get a 20% discount with your Barcelona City Pass (that will also give you free skip-the-line admission to Sagrada Familia, Park Guell and many other perks). 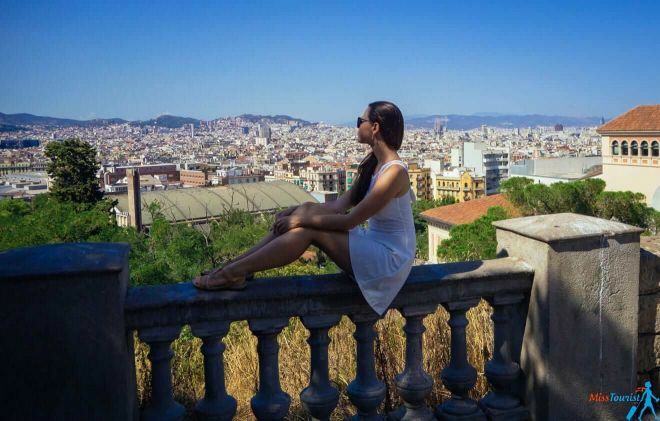 If you only have a short time available to visit Barcelona and you want to see some of its highlights in style – let me tell you about one amazing tour I have recently taken. 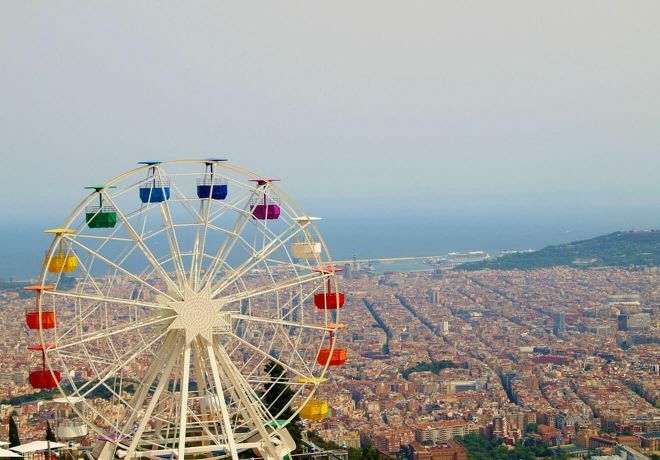 The tour takes 4 hours and it covers the main sights of Barcelona from three different points of view – Land, Air and Water. It is a one-of-a-kind tour that offers the widest range of activities that I found on the market at the moment! 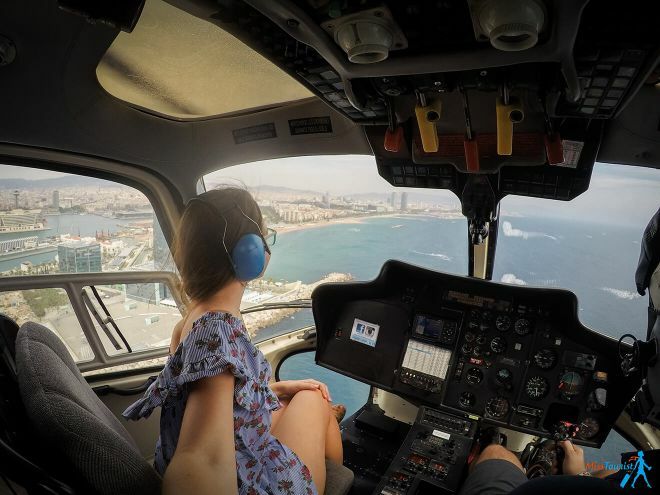 You will visit the most important sights with an English-speaking guide, fly around Barcelona by helicopter and sail on an old pirate boat close to Barceloneta beach. All this in half a day and for only 100€ per person? 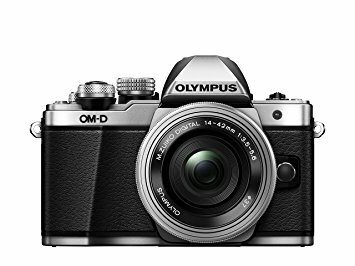 Definitely a great deal and some amazing photo opportunities – do not forget to bring your camera! 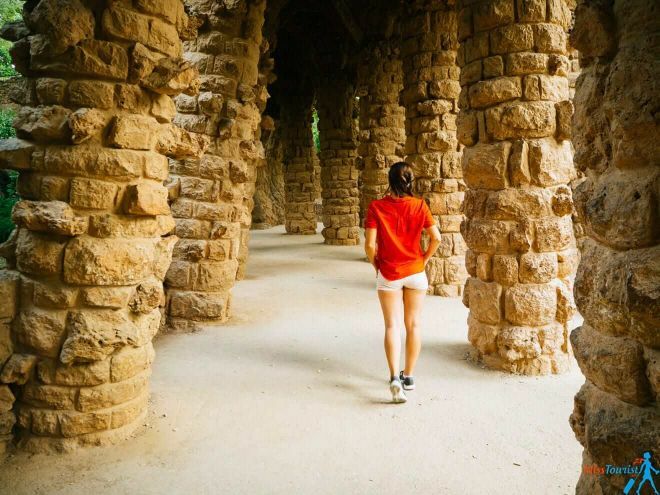 I took this tour and it was such a unique experience, I just had to add it to our Alternative list of things to do in Barcelona! 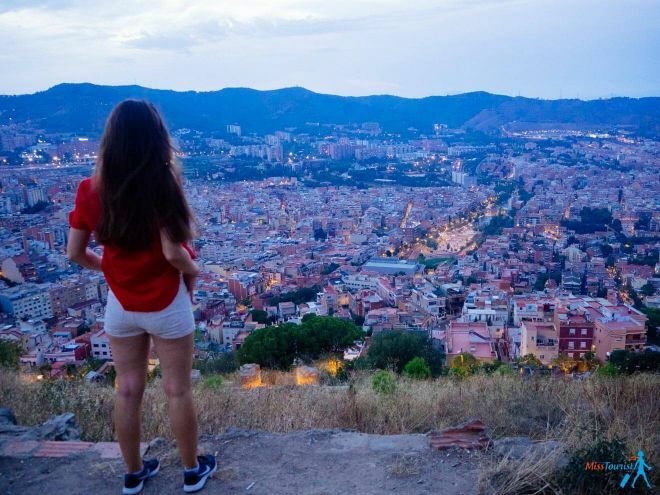 If you are looking for the perfect sunset in Barcelona look no further than the Bunkers! 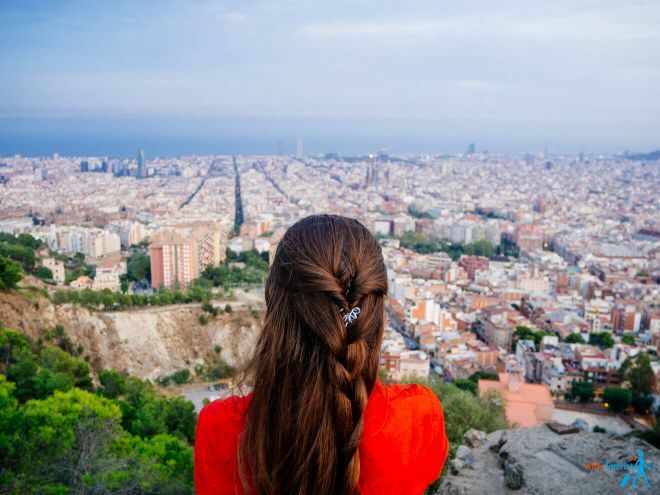 Even though this viewpoint is becoming more well known to tourists, it is still a local gem and it is far from the crazy crowds of Sagrada Familia and Parc Guell. 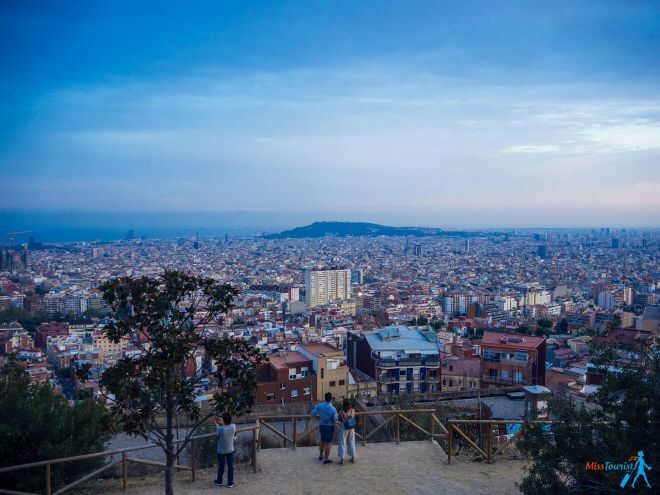 Bunkers provide a spectacular 360 view of Barcelona, especially recommended at sunset. In fact, the bunkers were originally built as anti-aircraft fortifications during the Spanish Civil War, the location was perfect for its strategic view over the entire city. There is pretty much nothing left from the bunker itself – just some concrete remains, but the panoramic views are totally worth the climb! Grab a picnic and your camera, and stay for the sunset! How to get there: You can walk up to the Bunkers from Parc Guell in about 15-20 minutes (just follow your Google Maps). It is not a hard climb, but it includes quite some stairs, and there are no elevators or public transport options this time. 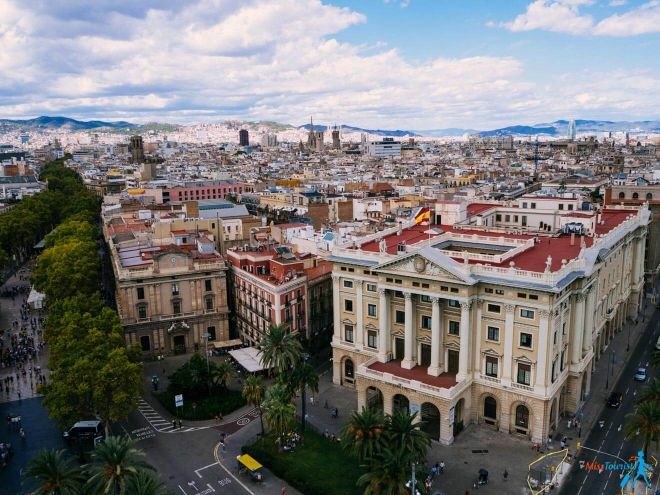 If you are looking for great hotels for your Barcelona stay, check out this post where all accommodations suggestions are sorted by neighborhood and price. This park is hardly known by tourists at the moment which makes it a perfect spot for lunch or just some relaxation. A famous scene from “Perfume – The story of a murderer” movie was captured there, did you know? Besides the labyrinth, the park has a beautiful 14th century house, a waterfall and many alleys to stroll around. 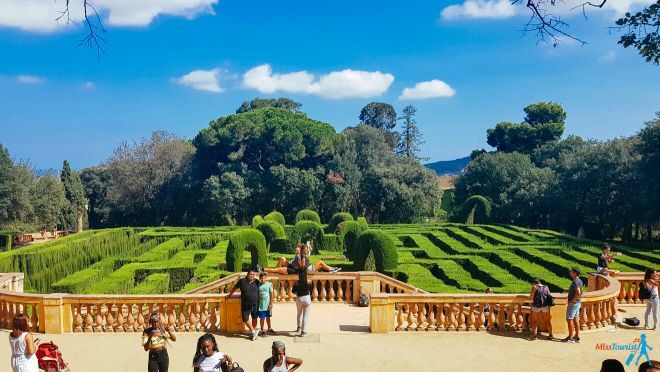 If you are going to visit with kids, here is a great post on 25 awesome things to do in Barcelona with kids. This 38-story office tower is not so spectacular during the day, but it becomes a real eye-catcher at night! The building has a peculiar shape and it is very similar to The Gherkin in London. Agbar Torre was built in 2003, but it has already become an important part of the city’s skyline. At night the tower is beautifully lit up in different colors! 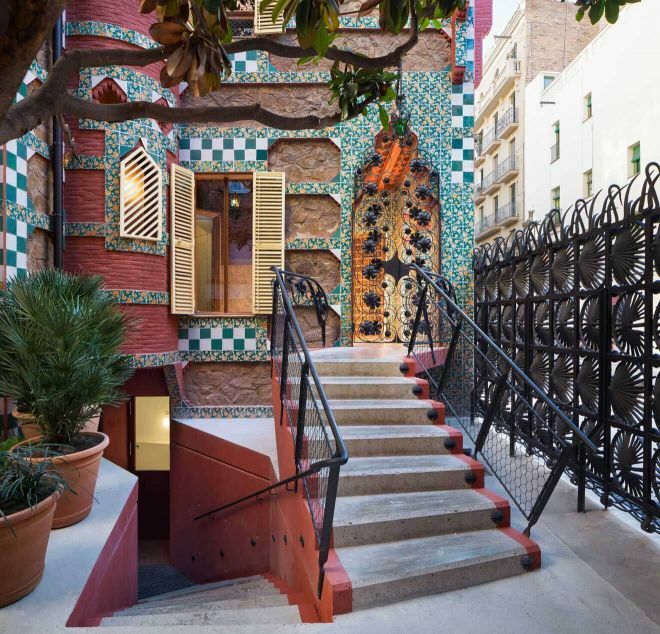 Casa Vicens, the first important project by Antoni Gaudi often remains forgotten by tourists. It is a beautiful modernist building now transformed into a museum. 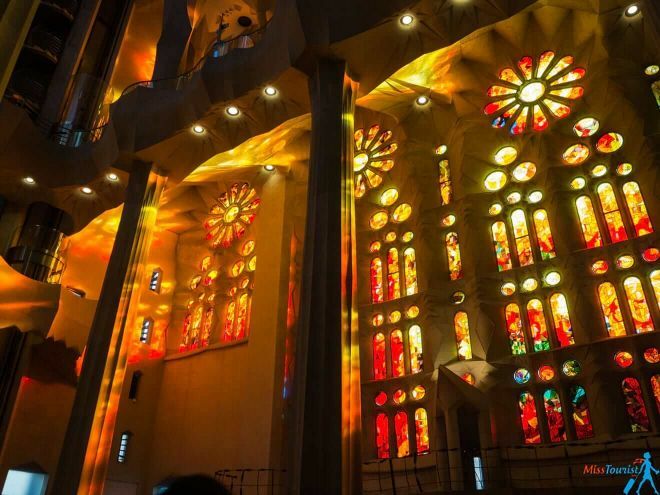 It has very bright, recognizable colors and it was of great importance for the evolution of this genius architect. The best part? No need to drive too far away, it is located on the north of the city center. Price: 16€ for a visit, 19€ for a guided visit. Book your skip-the-line tickets for no extra price here. It is quite a surprise to find such a charming square in the heart of the buzzling city! 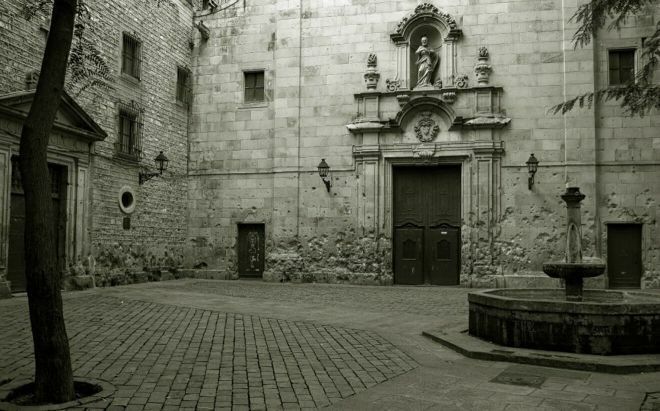 This is a very charming, secluded and lesser known square that made an appearance in movies like “Vicky Christina Barcelona”, “The Parfume” and even in the video clip of Evanessence “My immortal”. But the square has a rather dark history. Franco’s execution squads were executing school children there and you can still notice bomb traces dating from the Civil War. Despite its sad past, the place has a laid-back atmosphere now. 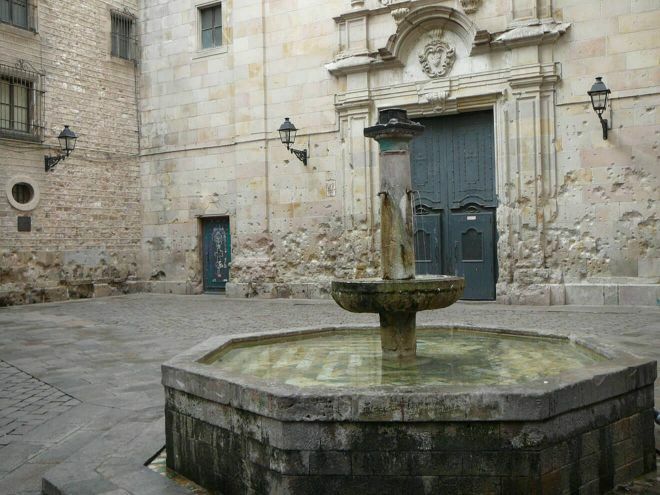 There is also a tiny café (where Vicky was flirting with Juan Antonio in the movie) where you can relax and enjoy the gothic architecture of the place. How to get there: it is a little hard to find it in the Gothic Qaurter?, but it is worth searching. It is not far from Barcelona Cathedral, but it is always better to use Google Maps to navigate along the narrow streets. If you want to see Barcelona in the most stylish way – rent a Vespa! Barcelona is a perfect city to discover by scooter because the traffic is organized, (not crazy like in Asia) the boulevards are wide and it’s easy to find your way. You can easily cover all the main attractions in one day and take some great pictures! You will pass by some local neighborhoods and see how people live there. I think this is the best way to see the city! If you have a driving license, book your Vespa here. You will get a Vespa scooter for 24 hours, helmets, basic insurance, locks and GPS. BONUS – RIDE A STEEL DONKEY (BIKE)! 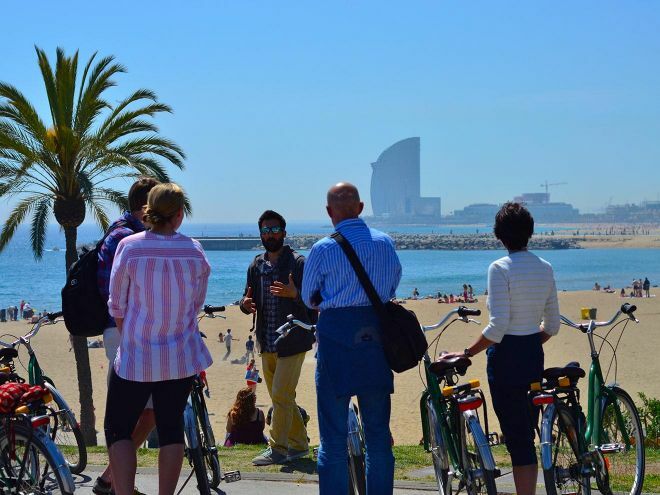 One company that specializes in showing travelers the original and unusual side of Barcelona is Steel Donkey Bicycle Tours. 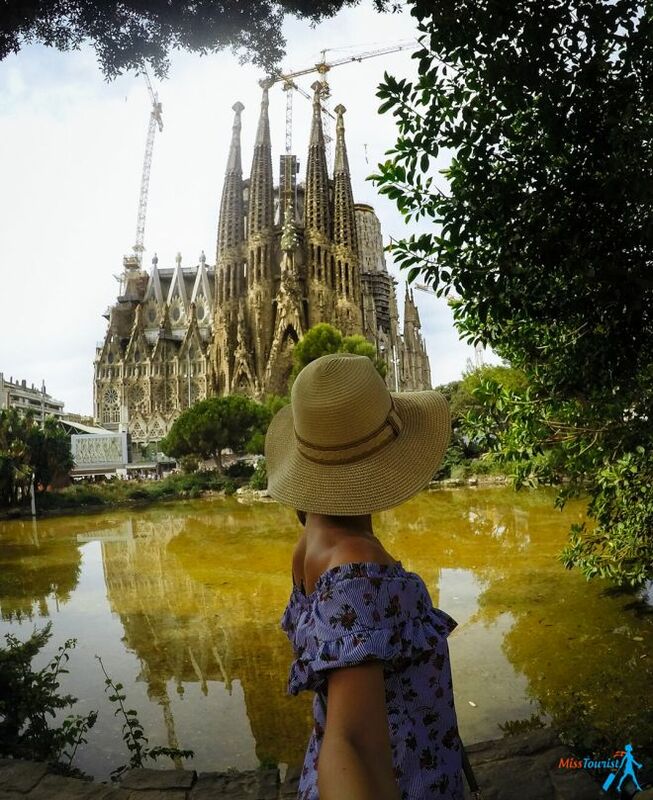 They believe that you can easily find Las Ramblas and La Sagrada Familia by yourself – so instead they take you to the city’s hidden squares, flea markets, local food bazaars, picturesque parks and cool modern architecture that you probably couldn’t find alone. One thing that makes them quite different from other bike tours is that they only ride with a maximum of 8 people, making it a more personal experience. You can also choose to ride an e-bike if you prefer! There are non-stop parties in Barcelona during summer, but some of the best ones are the “festa major” district festivals. 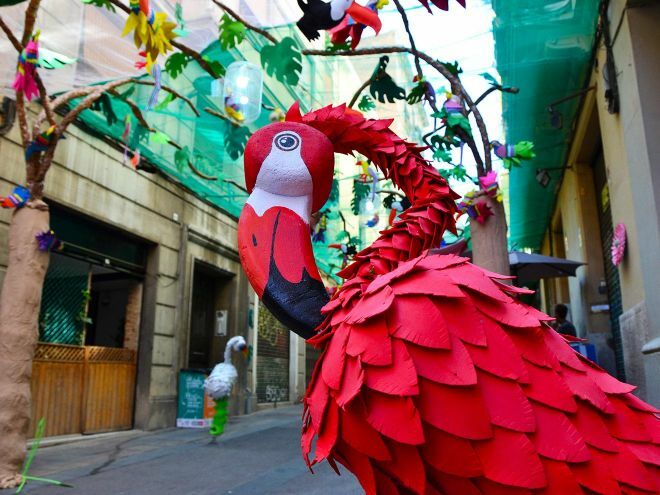 Every district in Barcelona has their own fiesta, which lasts about a week, and during that time the streets are full of people drinking and partying to live music by local bands and DJs. There are also workshops, artistic performances, crazy Catalan traditions – like building human castles – and much more. The most famous of the street festivals is La Festa Major de Gracia and every year during this party, the neighbors compete with each other to see who can decorate their streets in the best fashion, with each adopting a theme: like superheroes, a Greek symposium, a pirate ship, or arcade games to name a few themes seen in recent years. Best of all? These parties are free to attend! Here are the suggestions I have carefully selected for you. All of the hotels I suggest are located in the city center and each one of them has fabulous reviews. They are sorted into price categories for your convenience. Click the link to check the rates for your dates. Luxury (US$ 300 and up): If you are a football fan, Hotel Sofia, which is a five star hotel is the perfect choice for you as it is located 5 minutes away from the famous Camp Nou stadium. It offers wonderful rooms designed with a keen eye for details in a modern way which will make you feel right at home. Another five star hotel is Alma Barcelona GL, which features elegant decorations, a spa with an indoor swimming pool, a hamam, a sauna and a gym. A nice feature of this hotel is the indoor terrace, perfect for resting and relaxation after a hard day of sightseeing. Middle (US$ 100 – 150): Vasanta Hostal Boutique is a wonderful establishment which features nicely designed rooms in neutral tones and has a shared lounge. Coffee shops, restaurants and a lot of pubs can be found within walking distance from this accommodation option. 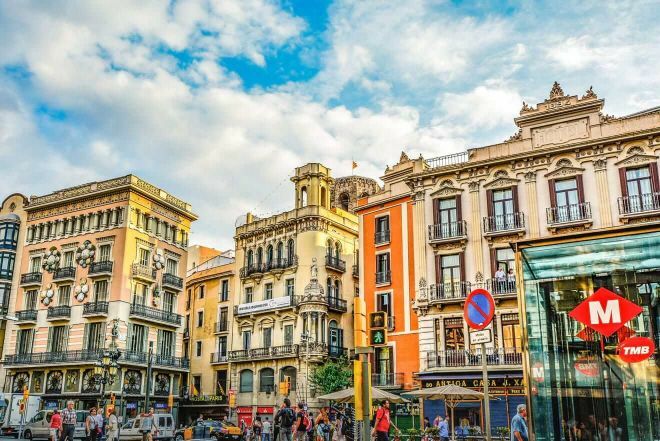 Another middle priced option is Hostalin Barcelona Passeig de Gracia which has been reviewed by its past guests as clean and an overall perfect choice. If you fancy wines, you will be delighted to hear that it is situated right above vinoteca Torres! 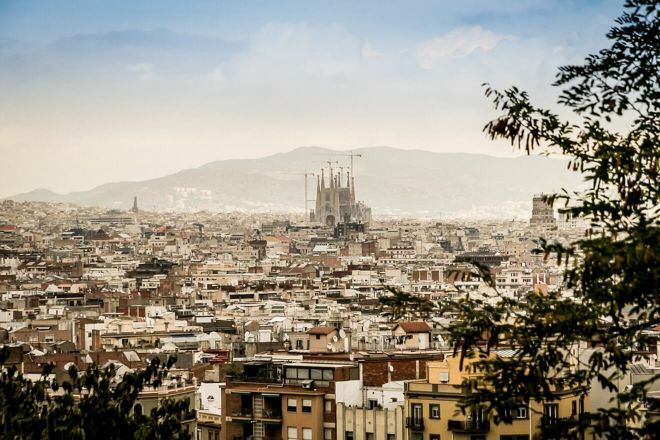 Budget (up to US$100): Rodamon Barcelona Hostel is situated right next to the Palau Robert Gardens, so if you fancy nature and visiting the surroundings, this is the perfect budget choice. Another great budget choice is Ten To Go Hostel, which offers a shared daytime area and even a pool. La Pedrera is located 2.8 km from the property and if you are traveling by train, Ten To Go Hostel is perfect, as it is located very close to the main train station. If you are looking for a hotel in Barcelona, I have this post where all accommodations suggestions are sorted by price and area. It does not mean it will happen to you, but you should really watch your belonging when in Barcelona. Pickpockets are all over the city and they are professionals. I have never heard so many stories of robberies in one city! Watch your bag at all times – in the metro, in restaurants, don’t put it in the free seat, keep it in your hands, I am serious! Don’t carry your passport with you. If you have a backpack, don’t carry anything of value there – keep your cell phone and your wallet close and visible to you at all times. NOTE: There are so many cases or robberies in Barcelona that the government of Catalunya implemented a new law that states that the investigation will not even start if the value of the stolen goods is less than 500€. The police just can’t deal with the volume of robberies! Barcelona El Prat airport is located 13 km away from the city and there are different ways to get from there to Barcelona city center by different means of transport. 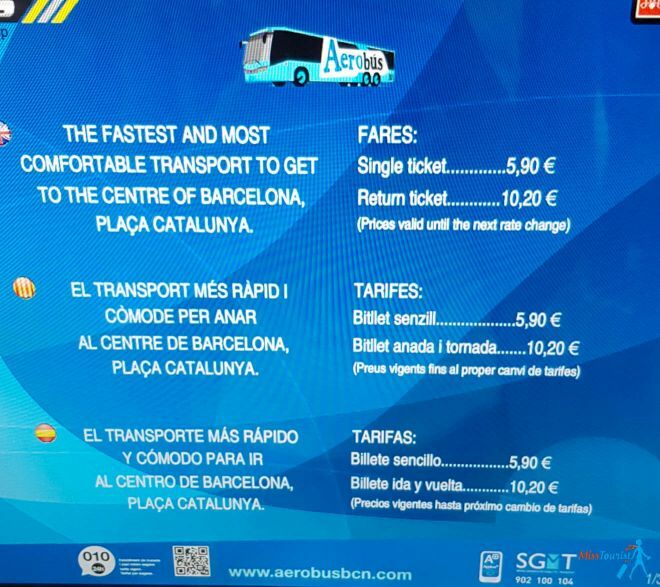 There is a bus that leaves every 5 minutes from the Airport, it costs 5,90€ one way or 10,20€ round trip. You can pay with your credit card. You can also buy it in advance on the website. The bus stops at Plaça de Spagna and Plaça de Catalunya, both of them are very central. From there, you can take a metro to get to your accommodation. 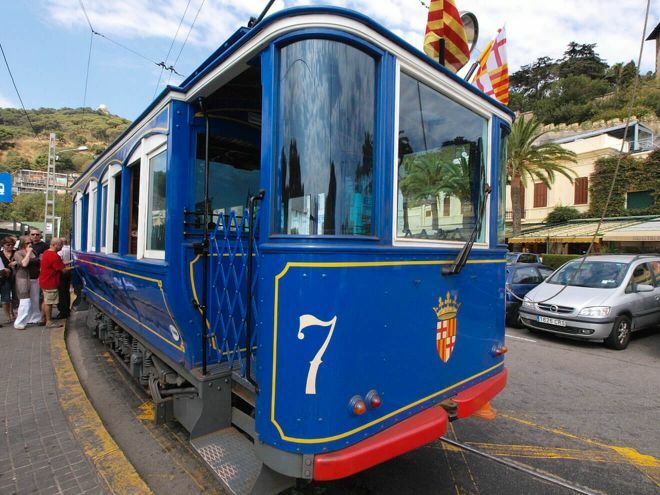 NOTE: Spanish people like to strike, so this transport might not be available sometimes. The public bus number 42 is slower than the AeroBus because it has more stops, but the great advantage about it is that you can pay the normal bus fare (you can buy the T10 package). If you land at night time, you can use Nitbus N17, the fare is the same. There is a RENFE train that passes approximately every 30 minutes and it will take you to the city center in 25 minutes. You can get off at either Barcelona Sants, Passeig de Gràcia or Clot stations. There is a shuttle bus that will take you to the train station for free. A single train ticket from the airport to the city center costs€4.10 and it can’t be used on the metro or buses. There is a new metro stop that was opened in 2016 and it goes directly to the airport! The line is called L9 Sud. This ticket will cost 4,5€, the T10 ticket cannot be used from the airport. Let’s start with the disappointment – there is no Uber in Barcelona! You can get a taxi app, it will be about 25-30€ to get to the city center. I remember the app told me that the estimation is 25€, but the final price together with the luggage charge was 30€. There are several car companies available right in the airport. Rates can be really attractive if you book in advance. Check this link for an exclusive 10% discount for my readers here! Single ticket for a metro ride in Barcelona is currently 2,2€. The T10 card (10 rides in the city) is 10,2€, which is pretty cool because it brings down the cost of your ride from 2,2 to 1€ per ride! What is also cool is that you can use it for 2 or more people. The bus ride will cost you 2,25€ if you don’t have the T10 card. You can’t buy the card from the driver. Unfortunately, you cannot rent public bicycles like in Paris. In Barcelona the bikes are only for locals, you can only pay per year and you will need a special card to register yourself in the system. One of the best ways to discover Barcelona as a local, in my opinion, is by renting a scooter (more information about it above). You will also probably walk a lot, Barcelona is a very walkable city, make sure to bring comfy shoes! Barcelona is a very special city, it changed a lot since 1992 (when it hosted the Olympics and many things got renovated and built from scratch). I have visited Barcelona 3 times, but it was not enough – I came back for more to live there for some time! 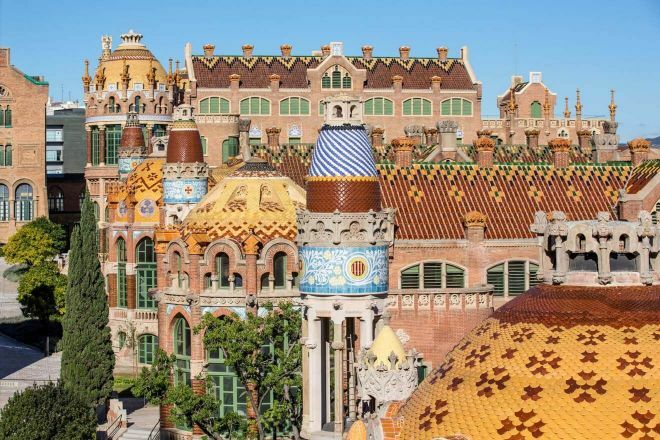 Barcelona is the city of Gaudi, modernism, Miro and Picasso. But it also has some “new” alternative attractions that you might not have heard about. 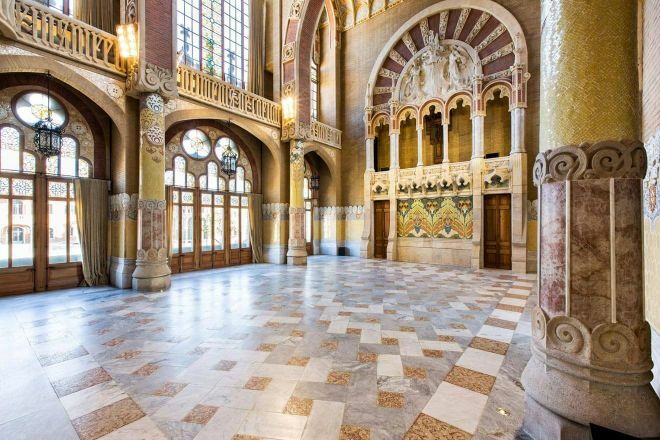 Here I described my list of 8 lesser known unique places to visit in Barcelona. I hope you discovered some new cool places for your Barcelona bucket list and you will visit some of them! What will you visit from this list? 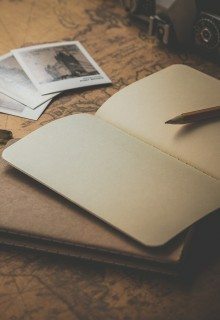 Let me know in the comments and Share this article with your friends, if you found it useful! Love this. We are going for our second visit in April and I wanted to find new experiences. Thank you so much. Are you welcome, enjoy your trip! Hope my comment help get this post even better. happy you like the post! I think Uber has very cut functionality, you can only use Uber X which is much more expensive than a normal taxi or any of the other apps (the government did it on purpose obviously). I hope it will change as soon as possible though! You are very welcome, have an amazing trip there!